Same figure but two different colour uniforms. This shows how shading can change how colours look. Ignore the jackets because they are different base colours. The trousers are both painted in the same colour. The guy in the black jacket was under coated in black, the other chap was under coated in white. The guy in the black jacket had his trousers shaded with a very dark blue shade. 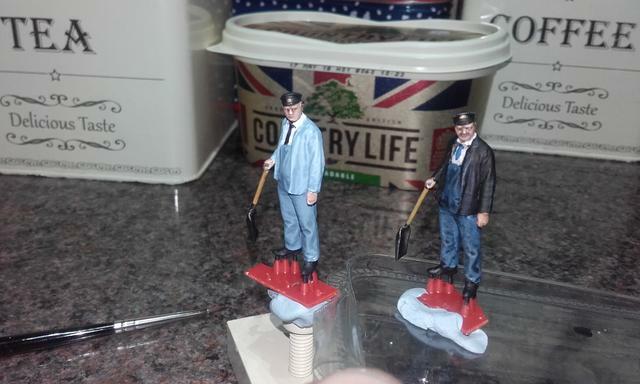 The other chaps trousers are shadowed with a medium Grey shade. Both shades are easily made by mixing a tiny bit of the coloured paint with matt varnish. You are here: Your Model Railway Club > Reference Area. > Hints & Tips > Shades.